The Seattle City Council has set three public hearings to discuss the proposal to vacate two blocks of Occidental Street, a key development in Chris Hansen’s plan to build an arena in Sodo. 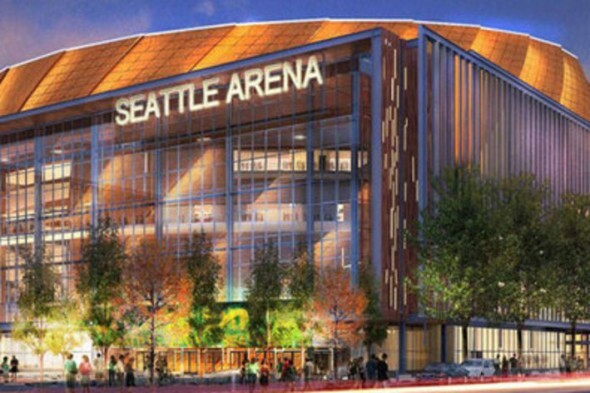 Chris Hansen’s Sodo arena will get a series of public hearings that will go a long way in deciding the project’s fate. Milestones of sorts finally are set for developer Chris Hansen’s much-delayed Sodo arena project: the Seattle City Council will have a public meeting March 15, and then transportation committee meetings April 5 and 19. The earliest possible vote by the full council on the issue at hand, a vacation of two blocks of Occidental Street, is April 25. The shutdown of the street to make room for the arena is the green light the project has awaited for almost two years. It is the first chance for the remade council, several of whom were not signatories to the memorandum of understanding between Hansen, the city and King County in 2012, to make their views on the controversial project a part of the public record. Council member Mike O’Brien, who disclosed the schedule to KING5 Monday afternoon, said the first hearing will be at 5:30 p.m. at City Hall. He also heads the transportation committee. The April 25 date is not yet fixed for a vote. KING5 reported that sources said discussions took place over the weekend among council members, staffers and even Mayor Ed Murray. Pressure was put on the council to set a date for the street vacation. A vote to end Occidental for two blocks south of the Safeco Field parking garage would dedicate a critical parcel of land to the arena, without which it cannot be built. Since it also would represent the first action taken by the council since the MOU’s creation, it potentially would be the target of litigation by opponents of the arena, principally the Port of Seattle and the longshoremen’s union. Since the project was disclosed in 2011, they have claimed that a third sports venue in Sodo would make worse an already poor situation for freight trucks leaving the port for the freeways. Lawsuits previously filed by opponents in 2013 were dismissed by a judge who said the litigation was premature because no action had been taken by the city. That situation would end with a majority vote to vacate the street. At the time, Hansen was attempting to buy the NBA Kings and relocate the franchise from Sscramento to Seattle, where they would have played in KeyArena temporarily until the Sodo arena was finished. The NBA, however, voted down a relocation after local investors raised the money to help Sacramento build a new arena. That slowed Hansen’s roll to a point where the arena project faded from public discussion. Hansen lost his primary benefactor in Steve Ballmer, who bolted to buy the Los Angeles Clippers for a whopping $2 billion. But Hansen used the time to buy up more parcels of land and resolve questions that the city’s planning department put to him, chiefly about transportation and parking, that came up in the project’s environmental impact statement. His original plan included a public park, new sidewalks and a pedestrian bridge in exchange for the street vacation. The EIS concluded that the impact of the street vacation would be minimal on traffic. The Seattle Department of Transportation agreed, stating in a November letter that there would be “no significant adverse impact” related to land use. The MOU calls for up to $200 million in public financing if both NBA and NHL teams occupy the arena, $120 million if one franchise appears. But so far neither close to being secured by Hansen. The NBA has expressed no interest in expanding. Its two franchises most vulnerable to relocation, Sacramento and Milwaukee, used the Seattle vacancy to extort their municipalities to help fund new arenas. The NHL has been interested in coming to Seattle ahead of any return of the NBA, and league leadership has met with Murray. But Hansen said he has no interest in owning an NHL team. He would entertain a partnership with someone who wanted to own an NHL franchise and partner with him in financing an arena, but no credible investor has emerged. If Hansen wins council approval for the street vacation, his project may become attractive to potential owners who didn’t want to get involved in a political fight in a town where they had no influence. The Ides of March? Oy! Such a Catch 22. The NHL and NBA won’t commit to an arena until it’s built and the city won’t build an arena until either sport league commit to coming here. After the NBA took an offer lesser than Hansen’s to keep the Kings in Sacramento (David Stern claiming the Kings had too much history to move them) and Silver’s subsequent slapping down every move Hansen has done since then makes me very skeptical on any movement on this. The city should save it’s money at this point if neither league is willing to get on board this. Heck, when the NBA fines Thunder minority owner Aubrey McClendon over $300,000 for telling the truth on why his group purchased the Sonics and tells him to never do that again tells you exactly what the NBA is about. At this point the city should save its money and fix their roads instead. you do realize the city is going to be paid back “their” money right? and also hansen doesnt get any contribution until teams are actually acquired anyways. The city isn’t just going to fork over hundreds of millions to hansen. How many sonics fans are left in this town? Maybe 25? ❝my neighbor’ s mate Is getting 98$. HOURLY. on the internet❞….A few days ago new McLaren F1 subsequent after earning 18,512$,,,this was my previous month’s paycheck ,and-a little over, 17k$ Last month ..3-5 h/r of work a day ..with extra open doors & weekly. paychecks.. it’s realy the easiest work I have ever Do.. I Joined This 7 months ago and now making over 87$, p/h.Learn More right Here:181➤➤➤➤➤ http://GlobalSuperEmploymentVacanciesReportsProfitable/GetPaid/98$hourly…. .❦:❦:❦:❦:❦:❦:❦:❦:❦:❦:❦:❦:❦:❦:❦:❦:❦:❦:❦:❦:❦:❦:❦:❦:❦:❦:❦:❦:❦:❦:❦:❦:❦:❦:❦:❦:❦:❦:❦:❦:❦:❦:❦::::181..